Leeds United sealed the loan capture of striker Edgar Cani today - just two hours after announcing Jamaican midfielder Rodolph Austin was staying at Elland Road. Cani, 25, has joined the Whites on loan for the rest of the Championship season from Italian club Catania with a view to a permanent deal. United tracked the 6’4” Albanian throughout the January transfer window and finalised his move just after 3.30pm, some seven and a half hours before tonight’s 11pm deadline. But even more significant was United’s lunch-time announcement that centre midfielder Austin was definitely staying put. Austin had been strongly linked with a move to Championship rivals Wigan Athletic and was reported to have sealed a transfer to the Lancashire club earlier today. But shortly after revealing midfielder Michael Tonge was leaving for Millwall, Leeds denied those claims and issued a statement confirming that Austin will stay at Elland Road for the rest of the season. The 29-year-old - who trained with Neil Redfearn’s squad at Thorp Arch today - was the subject of a £500,000 bid from Wigan last week, an offer which United turned down. He also attracted interest from Millwall and Cardiff City during the early stages of the transfer window but he has been a central figure in United’s team since the turn of the year, contributing to a run of four Championship games without defeat. United’s statement read: “Chairman Andrew Umbers and (the) club can confirm that midfielder Rodolph Austin is not for sale and will remain a Leeds United player beyond Monday’s 11pm transfer deadline. 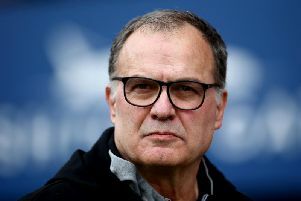 “There has been significant interest in the player and media reports over the weekend and on Monday had suggested that the club had agreed a deal for Rudy to exit Leeds United but this is not the case. “Rudy remains a vital part of Neil Redfearn’s squad and will play a major part for Leeds United in the remaining 18 Championship matches and beyond. New recruit Cani, meanwhile, was born in the Albanian capital Tirana but has spent most of his playing career in Italy. He started out at Pescara and also played for Palermo before leaving the Italian leagues for a spell with Polish club Polonia Warsaw. Catania - the club who Leeds recruited Giuseppe Bellusci and Souleymane Doukara from last summer - signed the forward in 2013 but loaned him out to Carpi and Bari during his first season in Sicily. Cani, an Albanian international, has made 15 Serie B appearances for Catania this term, scoring three times. One man who is heading out of Elland Road is United midfielder Tonge who has joined Championship rivals Millwall until the end of the season. In a deal which effectively ends Tonge’s career at Leeds, the 31-year-old will see out the rest of the term at The Den. Tonge is out of contract in the summer and last featured for United during their Boxing Day defeat to Wigan Athletic. The former Sheffield United player made a total of 76 appearances for Leeds and scored five goals, including a memorable volley during a fractious 1-1 draw at Sheffield Wednesday in October 2012. Despite his departure to Millwall there is no sign of movement in the opposition direction. Leeds head coach Neil Redfearn is interested in Millwall winger Martyn Woolford - also out of contract at the end of this season - but that deal appears to have gone cold.